Greece is well known for its wonderful cheeses. I think a Greek blog would be incomplete without introducing you to some of the most popular Greek and Cypriot cheeses. I have written about some of these cheeses in the past but I thought that it would be a good idea to put them all in one post with some recipes. In the future I shall be updating this post with more Greek cheeses. According to Greek mythology cheese making was given to the mortals by God Aristaeus, son of Apollo and Cyrene, who was the God of farming and animal breeding. Greeks have a long tradition in cheese making. There are references by Homer in Iliad and Odyssey (9th century B.C.) where he mentions «αίγιοντυρόν», meaning goat cheese. In Odyssey, Homer describes in detail what Ulysses and his men saw in the Cave of Cyclop Polyphemus, where the cyclop would make his cheese and leave it to age. In Greece most of the cheeses are made of ewes or goat milk or both and only a small part with cows’ milk. The biggest part of Greece (75%) is mountainous or semi-mountainous, so the breeding of sheep and goats was and is the best solution. Cattle are also breaded but in a smaller scale. Some decades ago, if they had cattle they were only breeded for the meat and whatever milk they collected from the cows they fed their dogs. This is not something I have read but my SIL told me about this as she was raised in their village. Consequently most of the Greek cheeses were manufactured with ewes and goat milk because of the morphology of the terrain and climate conditions. Sheep and goats graze freely in these regions with wild herbs and grass, far away from pollution and free of pesticides and fertilizers, thus making Greek cheeses organic. What makes Greek cheeses differ from other cheeses is the quality of the milk. In Greece there are 6.000 different types of plants and herbs and that is what affects the quality and aroma of Greek milk. Another factor is that the sheep and goats of Greece are from old breeds which are perfectly adjusted to the climate, they are strong with a very good yield of milk.The abundance of the flora of Greece allow them to freelybreed throughout the year. What makes cheeses different, apart from the source of the milk is the culture and aging process used in the cheese’s manufacture. That’s why sphella differs from halloumi, although both are semi-soft cheeses in brine, why halloumi and mozzarella are different, although the method they are produced is similar, kasseri, metsovone and graviera are different although all of them are semi-hard cheeses made from ewe’s and goat milk, why San Michali, Kaskavalli, Caciocavalli and graviera Naxou/Tinou are not the same, although they are made from cows’ milk and why myzithra, anari or parmesan and ricotta are different. I have compiled a list of the most popular cheeses which I use often in my recipes with a short description. Feta (Greek φέτα) is the most characteristic Greek cheese and well known around the world. It is a white semi-soft to Soft cheese, ripened and kept in brine for at least two months. Feta is manufactured only from pure ewe’s milk or a mixture with goat milk. Not anyone in Greece can produce feta. Feta is produced in certain parts of Greece such as the mainland, Macedonia (the real Greek area), Thrace, Heperus, Thessaly and the Peloponnese. The only island that can produce feta is Mytilene. In other parts of Greece it is called white cheese. Feta is consumed as table cheese, perfect for pies, in casseroles, in appetizers (mezedes), in dips, eaten with fruit and of course a must in the Greek salad. Beware of other white cheese produced outside Greece with the name “Feta” as they are made with cow’s milk and do not compare in taste. Although feta is a unique cheese, in case you cannot find it you can substitute it with goat cheese. Katiki (Greek Κατίκι Δομοκού) is a soft cream cheese made from goat and/or goat and ewe milk and salt (1%), with a low fat content (10 -14%). It is named Katiki Domokou, from the region where it is manufactured. Domokos, is a Department of Fthiotida, Central Greece. This type of soft cheese is eaten as a starter, in salads, in dips, in pies or on its own with bread and white wine or retsina (resinous wine). You can substitute Katiki Domokou with soft feta mixed with Greek yoghurt or goat cheese softened with Greek yoghurt. Graviera (Greek γραβιέρα) is one of the most popular cheeses in Greece. It is a hard cheese with a light yellow color, and has a slightly sweet and nutty taste. The Cretan graviera, which is my favourite, is made with sheep milk, or sheep milk with a small amount of goat milk. Graviera of Naxos is made with cow’s milk or mixtures with ewe’s and goat milk. It has a rich, sweet and buttery taste. Graviera can be used in many dishes, in Greek pies, grated in pasta dishes, served as a table cheese or as a delicious snack along with bread and fruits. It is produced with sheep’s milk and has a wonderful rich and spicy flavour. It is perfect on its own, as a meze with a glass of red wine, as saganaki or in pies. You can substitute graviera with halloumi or with Gruyère or Jarlsberg. Kefalotyri (or Kefalotiri) (Greek: κεφαλοτύρι) is a hard, salty yellow cheese made from sheep milk and/or goat‘s milk in Greece and Cyprus (cow’s milk is not allowed in the Cypriot version), although, a similar cheese Kefalograviera, which is made with cow’s milk, or a mixture of sheep and cow is sometimes sold outside Greece and Cyprus as Kefalotyri. Depending on the mixture of milk used in the process the color can vary between yellow and white. You can substitute it with other Greek cheeses such as kefalograviera, graviera, halloumi, or Pecorina Romano, Pecorindo Sardo, Parmesan or Asiago. Ladotyri (Greek: λαδοτύρι), from ladi (olive oil) and tyri (cheese) also called Kefalaki (head) is produced from ewe’s milk or a mixture of ewe’s and goat milk (the goat milk should not exceed 30%) and is produced in Mytilene, the capital of the island of Lesbos. It is a hard, piquant and salty cheese which is preserved in olive oil and that is why it is called “ladotyri”. Similar cheese is also produced in Zakynthos island. 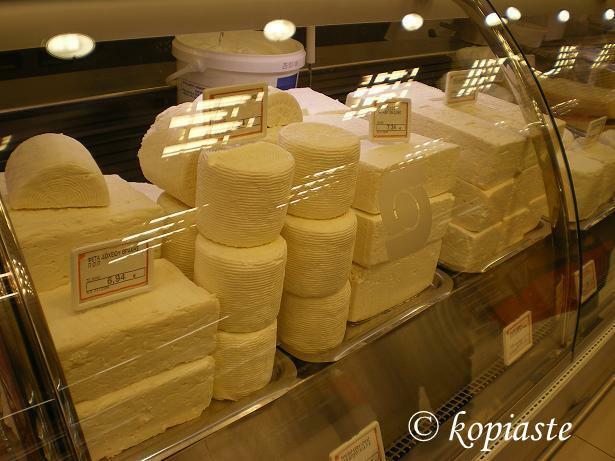 In Syros there is also a similar cheese, called San Michali, although it is produced with cow’s milk. It is used to make saganaki, eaten as is and grated. I use it to make Flaounes as it resembles in taste to Paphitiko cheese. It can be substituted with kefalotyri or parmesan. Kasseri (Greek: κασέρι) is a semi hard cheese, produced from ewe’s milk or a mixture of ewe’s and goat cheese (not exceeding 20%). It is considered to be one of the oldest cheeses produced in the world. It is mainly produced in the region of Northern Greece: Macedonia, Thessaly, Thrace but also in the island of Lesvos. It is consumed as a table cheese, as an appetizer, in sandwiches but also cooked in dishes where cheese needs to melt, such as peinirli or pizza. You can substitute kasseri cheese with other Greek cheeses such as graviera, kefalotyri or halloumi or Provolone, Caciocavallo or mozzarella. San Mihali (sahn meeh-HAH-lee Greek Σαν Μιχαλη) is a fine white-yellow, hard cheese and a PDO product which is exclusively produced on the island of Syros. It is one of a few Greek cheeses produced only by cow’s milk. It takes its name from the Catholic church of Saint Michael, in Syros island, where it used to be produced by catholic monks. Its flavour is similar to parmesan. It can be consumed raw,made into Saganaki, used grated in pies, with pasta and fruits. Served with white and light red wines. You can substitute San Mihali cheese with other Greek cheeses such as kefalotyri or Parmesan. 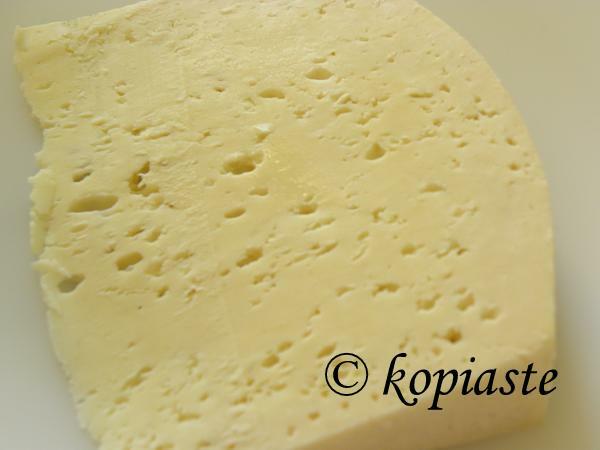 Sphella, (Greek Σφέλλα) is a hard white cheese from Lakonia (Taygettus region). It is siilar to feta or rather something between feta and kefalotyri but more piquant made from ewes and goat milk. You can substitute it with hard feta. Xynomyzithra (Greek Ξυνομυζήθρα) is a cheese indigenous to Chania, Crete. It is a low fat cheese, similar to soft myzithra and anthotyro in texture. It is made from sheep’s and/or goat milk, yeast and salt. It is left 24 hours at room temperature and it gets this slightly sour taste. It is ideal for pites (pies) and in savory dishes. It can hold for 2- 3 days in the fridge but for a long period of time in the deep freezer. It can be substituted with myzithra (anthotyro or anari) and ricotta with some lemon juice to recreate the sour taste. Fresh Anthotyros (Greek ανθότυρος) – myzithra (μυζήθρα or anari (αναρή), as they called in different parts of Greece, is one and the same thing. This soft cheese is manufactured from ewe’s milk – and/or goat-milk whey. After making hard cheeses such as feta, kefalotyri, graviera, halloumi etc., goat or sheep’s milk is added respectively to the whey and the cheese is produced. Manouri (Μανούρι), on the other hand is made the same way but by adding cream, so this makes it a fatty cheese. There are two forms of these cheeses. When fresh they are soft, snow-white, creamy, and granular; They are usually used as a table cheese, in savory pies (pites) but also in desserts, eaten alone with honey and cinnamon or other desserts, such as tarts, cheesecakes etc. They go well with fruit such as figs, pears, and apples. They are preserved in the refrigerator for 2 – 3 day. It can be substituted by ricotta, queso fresco or paneer. To preserve myzithra for a long period, it is salted and then dried. It then becomes hard with a creamy, salty, sharp flavour. It is perfect for grating on top of pasta. It can be substituted with kefalotyri, halloumi, graviera or ricotta salata, romano, cotija or parmesan. Kaskavalli (Greek Κασκαβάλλι) is a Greek and Cypriot table cheese, which I would describe to be similar to kefalograviera. It is a hard, yellow cheese and it is characteristic from the many holes it has, when it is cut. Its origin is from Italy but I don’t know when they started making this cheese in Cyprus, probably during the Venetian occupancy of the island. The Italian name of this cheese is cacio cavallo, which means “horse cheese” as it was believed that it was made of mare’s milk but there is no historical evidence of this. Nowadays this Southern Italian provolone cheese is made with cow’s milk. It is more likely that it was named cacio cavallo because they usually tie two balls of cheese at a time, with one string and then hang them from a beam “a cavallo” to dry, as though astride a horse. It can be substituted with kefalotyri or kaseri or caciocavallo, provolone, scarmorza or mozarella. Halloumi (Greek χαλλούμι), is a Cheese, indigenous to Cyprus, well known for its unique taste. It is manufactured from a mixture of goat’s and sheep milk.It has a high melting point, and so can easily be fried or grilled. The cheese is white, with a distinctive layered texture and has a creamy, salty flavour. It has also the taste of mint. Halloumi is formed into a round flat disc, then mint is inserted into the middle and halloumi is folded into a semi-circle. The mint adds to its distinct flavour but originally it was inserted for its natural anti-bacterial action that was traditionally helpful to increase the life of the cheese. Aged halloumi becomes harder and saltier and is perfect not only as a table cheese but also for grating on pasta. Halloumi is the only cheese you can eat fresh as a table cheese, fried, grilled, barbecued, boiled in soups, broiled… perfect in salads or with fruit. It is a unique cheese but in some cases it can be substituted with kefalotyri, graviera, feta or queso para frier. What a great overview Ivy! I must admit I have not tried them all as a few are not available so readily down here, but if I do one day, I will definitely come back here for guidance of how to use it. Very nice, Ivy, and very interesting. The most recent cheese-making book I got has recipes for a number of the cheeses you mention. If only I could get some ewe’s milk! This is a fabulous and very complete review of Greek cheeses, very useful for me as we are just starting to taste some of the cheeses from Greece with Kafalotiri being the first one other than feta. I’m will look for Graviera and perhaps some of the other cheeses if I can find them in US. Greek cheese is sooooo fine! I really loved that cheese you gave me… I still dream about it ;-P! It was nice read about Greek Cheese. I had so much of knowledge update from this post. Wow! What a fab post – I have never heard of any of these cheeses other than feta and halloumi. Thanks for showcasing the diversity of Greek cheeses. a wonderful post,ivy!so many chesses…i love all the chesses! Thanks a lot for leaving your comments. Shall try and visit as many as I can, as I am having problems with my internet connection. Please bear with me until I change into a new provider. Wow one of the most informative post. And such beautiful looking cheese pictures. Wow Ivy! This was like a class:-) Great information & a lot of cheese that i have not even heard of, forgetting tasting them! Thanks for this! I am sure i will have to refer to this for my knowledge later. Thanks for this information! I wish I could taste all of these while reading about them. Only a few are available here. Out of all the Greek cheeses you mentioned, I have only tasted 3 of them. Now I’ll have to go to the Greek supermarket in town and seek out the others. Great post! I liked seeing the pictures and the information was enlightening! And if I was not missing Greek cheeses enough … thanks for the info Ivy! Cheese is probably my favorite thing in the world (hence my need to go on a diet) and this was fascinating – you mentioned many cheeses I haven’t heard of. I just came to your blog after reading about Peter M’s vacation – I want to visit Greece so badly!!! Ivy, what a wonderful synopsis you have made here of Greek cheeses! At La Formagerie in Marylebone, London, England I asked what cheeses I should keep an eye out for in Athens. Answer, "barrel aged feta" how boring! I will try and find Xynomyzithra and Katiki. Are there any food delicatessen I should visit while in Athens? Hi Suzan. Barrel aged feta is good, although my favourite is Dodoni and Delta. I don't know where you can find a good delicatessen but if you visit Evripidou Street (Center of Athens) there are some delicatessen selling cheese. The easiest way is to visit any big supermarket, Veropoulos, Vassilopoulos, Sklavenitis, where you will find most of the Greek cheeses. I haven't covered all the Greek cheeses in my post yet and I can suggest Formaella, which is again a wonderful cheese to make saganaki, Metsovone, San Mihali and the past years Greece is also producing various buffalo cheese, similar to Mozarella and buffalo feta. I discovered halloumi a few years ago as I moved to Cyprus, never heard of it before. But straight away I fell in love with that delicious cheese that is so versatile and gives its special note to so many dishes. Very often we try new halloumi recipes and there is not one week since then, that we wont have at least one meal with halloumi, not to speak about BBQs, where having halloumi is a must. Thank you Jeff for this information. I am sure some of my readers would love to try it. I will try this definitely and give it to my parents to try it as well, they love cooking and experimenting with foods and spices! Well researched and finely written article full of useful info. Well-done , its a great information. Hope you add more in the future. Thumbs up. Many thanks for sharing this.